Not So Cli-Shéa: Deal of the Day! I am SO excited about something that I just HAVE to share. So, my friend Danica and I enjoy all of the designer-things-for-less blogs like Copycat Chic. Well, welcome to my first designer-thing-for-less post! I found it while thumbing through a Home Decorators catalog. Recently when Danica got married and moved out, she took some of the living room furniture with her, so, I had to do some shopping to replace a few things and got a new tv stand and coffee table that happen to match this bookshelf perfectly with the x's on the sides. 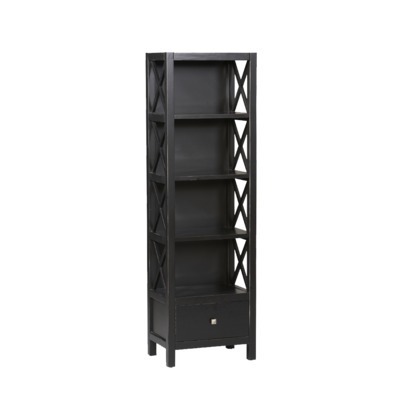 I wanted to get two of these bookshelves for either side of my TV stand to house all of my DVDs (I have quite a large collection that currently resides on the floor by the TV awaiting a new home). Unfortunatly money is kind of tight and these bookshelves run $279 PLUS $40 shipping... PLUS tax! We're looking at about $350 a PIECE. Like most struggling twenty-somethings I definitely don't have an extra 700 bones lying around. 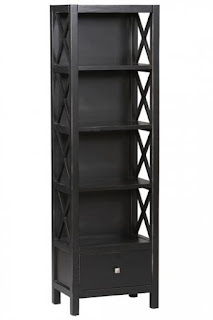 And then today, I was perusing target.com, like I often do and look what I found! At target.com they were selling it for $229.99! BUT wouldn't you know it, they were having a home sale and it was marked down to $169.99! That is almost $130 cheaper than the original unit! NOT including the $40 shipping they were going to tack on! AND I had a $25 Target giftcard from Christmas! When everything was said and done I spent a grand total of $332.76 (307.76 less the gift card) for TWO bookshelves that I have been dying over, which is LESS than I would have spent on ONE from the other place. As if I didn't love you before, this has just reassured my love for you. *sidenote: my grandma gave me $250 for my birthday this year, which I used on the bookshelves, meaning I spent less than $60 out of pocket. I am BEYOND thrilled!